Is MyLotto24 a Scam or Legit? Read 7 Reviews! MyLotto24 Exposed — Is It Worth Your Time? MyLotto24.co.uk is an online lottery site that offers the chance to play in two European lotteries, German’s 6/49 and Spain’s Bonoloto and a Euro Syndicate (based on the Spanish Euromillones. It was founded in 2007 by Tipp24 which is listed on the German Stock Exchange. MyLotto24.co.uk’s registration process is relatively straightforward asking for the usual personal details. You can use a variety of credit cards or debit cards to make a deposit and begin to play. MyLotto24.co.uk prohibits the purchasing of tickets by people in the USA and any other country where online gambling is not permitted. A full list is not provided, and players are supposed to know the laws of the country they are residing. Customers have to use email support, or UK supports telephone line for help during business hours (8 am to 8 pm Monday to Friday, and 8 am to 6 pm on Saturday GMT). There is no live chat. There is also an online support page, and they do have an FAQ page. The site claims a membership of more than 2.4 million players with a payout totaling €200 million. Both claims are hard to believe considering the limited number of lottery games offered. Another aspect of the site that raises more questions than answers is its use of ‘Session ID’. With Session ID, you stay logged into your account until the time you manually log out of it. With your account holding sensitive personal data, the data is open to anybody with access to your computer. The site potentially allows third-party advertisers to monitor your transactions while on it. Most reputable online lottery sites offer multiple lottery games (EuroJackpot, El Gordo, France Lotto, etc.) to its players. MyLotto24.co.uk has a selection of only two lottery games and one syndicate on their plate, the Spanish Bono Lotto, Germany’s Lotto 6/49 and Euro Syndicate. 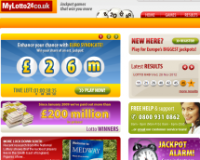 This begs the million-dollar question, is MyLotto24.co.uk worth your time? If you are only interested in the specific lotteries offered, they can be found on other online lottery providers where you’ve also got the option to play some of the massive jackpots! This site gets a thumbs down. I was really happy when i bet with myLotto24. After reading the bad reviews i was a bit skeptical but i decided to give them a go. Registration was easy, i placed my bet and payment was smooth. i also won a few quid which was a bonus. I wasn’t sure how the subscriptions worked so i contacted their customer support and they answered within minutes and were super friendly and helpful. The only thing id like to see is more syndicate games. Started an account without my permission. Randomly had £60 taken from bank account. I am disabled so living on benefits I cannot afford to suddenly lose such a large amount of money. Took money from my account. I never play lotteries so caught it straight away. Bank refunded payment and are investigating these fraudsters. I do not remember ever playing lotto 24 yet today I have been charged £60 on my card without any sort of warning or confirmation, not happy about this so I have had to cancel an account, I was unaware of starting in the first place. Give me a break! Seriously. Only two lotteries! Add to that the fact that they can share your details with others. I don’t know why anyone would play here. Thanks Lotto Exposed for exposing this one. I’ll stick to the approved lottery providers that offer so much more. Guess something changed here at MyLotto24. There are no usual lotteries to play but all over site is their lottery and drawings are only that. Also they became charity lottery now and created a fundraising for charity. Maybe team should look into this since they had such a bad review in the past. Still don’t trust them. i have not received any mail, i checked my junk box, my incoming mail. my out going mail. i have never received or sent anything to them!! tried to contact them but they claim the office is closed until 9th of june! !